Refer to “gearshift shaft / gearshift cam plate removal and installation” . Check the gearshift shaft for bend or wear. Check the return spring for damage or fatigue. If any defects are found, replace the defective part(-s). Inspect the gearshift shaft oil seal lip for damage or wear. 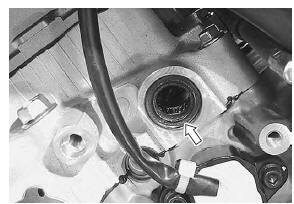 If any defect is found, replace the oil seal with a new one. Inspect the gearshift shaft bearings for abnormal noise and smooth rotation. Replace the bearing if there is anything unusual.